What do you think about these facts? 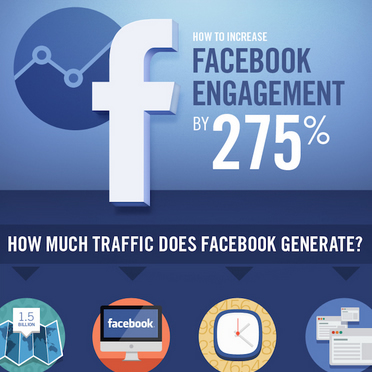 Are you having a satisfactory level of engagement on Facebook? Nice infograhic Enstine. I agree about posts with question engage more users as I have experience it. Also, image posts works better than only text posts. Nice share! Hi Enstine, its nice to be on your blog again. Unlike twitter, Facebook is really a good engagement platform. Sometimes i am forced to think that the basic engagement social media network is facebook. And i also agree with Atish ” Question post engages people more”. Though lately i haven’t been engaging my users more. but that one aspect i’m going to work on this year. Welcome back Philip and hope the year is kicking off well with you. There is no doubt that Facebook help us in increasing the engagement. It is really a good engaging platform than other social media sites. The infographic has all the good points that we miss. Thanks for nice share. Even though the stats showing how many people use and log in to Facebook daily are not new, it’s still mind-boggling to read each time. 699 million people logging on to Facebook daily is nothing to scuff at! Who wouldn’t want to reach as many of these 699 million people and increase their Facebook engagement by this staggering 275%?! Good that that this infographic shows it’s not really just luck but it’s by doing the right things. Thankfully the right things are revealed, for anyone to learn from and do the same, to achieve similar or even better results. Whether one wants to know the best time to post or the best type of content to share, the infographic reveals it all and much more. Once again, great share, Enstine. Good to see you have shared this on Kingged.com yourself. I have “kingged” it and I am sure other Kinggers will do the same. Anyway, thanks again, Enstine. Keep the awesome KINGLIKE content coming! I used quote alots, whenever I came across a good one from top leaders, I shared it on my page. According to the infograph, asking questions works best. This I will start implementing on my page. One problem I see with this is, it definitely going to work best if you have good amount of followership. Something my page lack at the moment. Now, my focus should be on giving more value to the community and hopefully it will pay off. I made a mistakes in my previous comments, I wanted at the closing of it to say, “Thanks for sharing Muki”, I type “Luku” instead. please correct the mistake on my behalf. It was due to auto completion enable on my mobile device. “Delete this comment”. Well I guess I’m just wasting my time at facebook, after reading this awesome infographics I’d say I’ve gained some unique information. Well Facebook is the biggest platform to get in touch with the people, but it is also used to promote the online business. It is the biggest social media website that people are using every day to get in touch with the people no matter what the distance is. Yes, Quick Sprout produces some fantastic infographics and this is one of them. The posting/engagement tips are very useful. I was searching for this information that when I should share my post on facebook and Neil has solved my problem. Thank You for sharing. I am very happy today! I love to read your posts and your new blog is growing so fast it’s crazy, so I will keep returning, especially as I keep seeing your stuff all over Kingged, ? About Kingged being a wonderful source of traffic to you, that’s nothing compared to what we have in the works. We will be able to drive hundreds and even many thousands of extra readers to lots of the posts shared on Kingged, with our plans to partner with 100+ blogs in the coming days. More details coming soon, ? Yes definitely facebook have lots of potential users. recently i bought facebook page that have approx 50k likes. but in 1 month my page like increases with rate of 1000likes / per day . its all because of how relative content you posted on page. Make Money Blogging ~ 15 Top Bloggers reveal their secrets!